West Orange - Stark High School Precision Machine students swept the District 7 SkillsUSA Speed Skills contest earning first, second, and third place in the machining competition. Additionally, all WOS precision machine projects earned blue ribbons and advancement to the State Projects Contest. 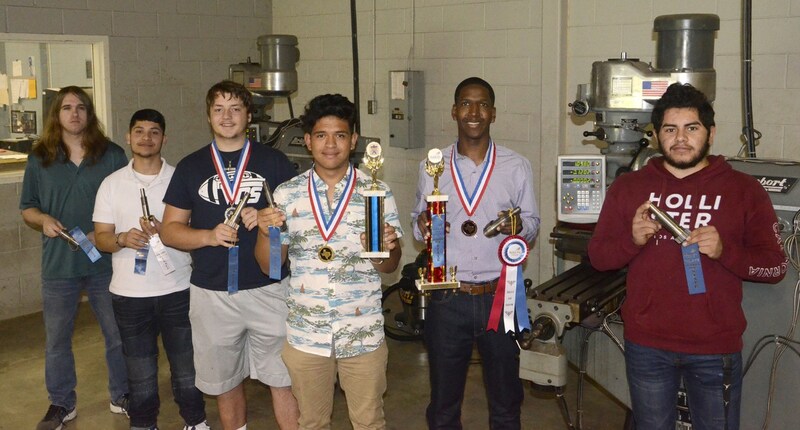 Congratulations to Kade Cornett, Jonatan Ramirez, Bruce White (2nd in Skills), Carlos Gutierrez Vilches (1st in Skills), Jacoven Hinson (3rd in Skills and Best of Show in Projects), and Raul Maya! Carlos is now qualified to compete in the State Precision Machine Contest in Corpus in April. Carlo Paulino is the Precision Machine instructor.